The IBA group, a global proton therapy machine specialist, has built nearly 300 cyclotrons since being founded in 1986. Its success is based notably on leading-edge magnetic measurement expertise: each acceleratorParticle accelerators were developed by physicists to study the elementary nature of matter. Nowadays, they are usually immense, highly international... requires thousands of high-precision Hall probeThe actual sensor that is placed in the magnetic field. The NMR probe contains the NMR sample; the Hall probe... measurements. We took a look inside with Yves Paradis, in charge of magnetic measurements at IBA. Proton therapy is more accurate than conventional radiotherapy and produces fewer unwanted side effects. It has expanded rapidly since the 1990s, thanks largely to the incomparable results obtained on certain brain and spinal tumours and in paediatric applications. 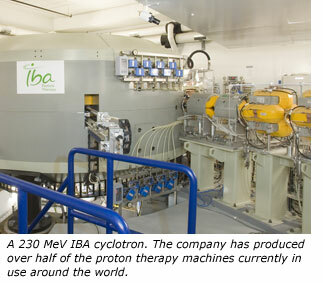 Belgian company IBA (Ion Beam Applications) has played a major part in these developments: it has produced over half of the proton therapy machines currently in use around the world, and they have already benefited more than 50,000 patients. One of the company's core businesses is the building of complete proton therapy centres, ranging from the acceleratorParticle accelerators were developed by physicists to study the elementary nature of matter. Nowadays, they are usually immense, highly international... itself – a 230 MeV cyclotronA compact particle accelerator that allows the particle beam to spiral out as it gains energy.... – to the building including the beam lines, gantries, nozzles and all their controlAn NMR-controlled field is one whose strength is monitored by NMR. As opposed to NMR-regulated.... units. Other smaller IBA cyclotrons also play a role in nuclear medicine. For example, the C18-9 is mainly used to produce Fludeoxyglucose (FDG): a radio tracer commonly used in Positron Emission Tomography (PET). FDG is a glucose analogue concentrated in cells where there is a high energy demand such as brain, kidney and, unfortunately, cancer cells. When combined with a CT scanner, PET indicates the precise location of tumours and helps doctors measure important bodily functions such as blood flow. The C18-9 is the most commonly used IBA cyclotronA compact particle accelerator that allows the particle beam to spiral out as it gains energy..... Also noteworthy are specific projects such as the C70, a multiparticle research cyclotronA compact particle accelerator that allows the particle beam to spiral out as it gains energy.... set up in Nantes in 2008. The heart of a proton therapy centre is the accelerator, which produces a proton beam used to irradiate the cancerous cells. "To keep the protons on track during acceleration, the 230 MeV cyclotronA compact particle accelerator that allows the particle beam to spiral out as it gains energy.... contains resistive coils generating a constant magnetic field up to 3T – about 60,000 times the magnetic field of the earth," explains Yves Paradis. After a thousand turns in the cyclotronA compact particle accelerator that allows the particle beam to spiral out as it gains energy...., where the beam is accelerated by an electric field in four accelerating gaps, the protons are extracted and directed into the patient’s tumour by the beam line: a set of bending magnets and quadrupoles keeping the beam on track and focused. The cyclotronA compact particle accelerator that allows the particle beam to spiral out as it gains energy.... delivers protons at a constant energy of 230 MeV, corresponding to a penetration depth of 30 cm into a patient's body. A degrader followed by an Energy Selection System (ESS) is used to modulate the energy from 70 to 230 MeV and, hence, the penetration depth. The magnetic structure of the C230 is quite complex. To compensate for the relativistic effect and maintain a reasonable outer radius, the magnetic field must follow the relativistic factor gamma and thus increase in proportion to the radius. This increase has a defocusing effect on the beam, so the C230 is fitted with spiralled sector-focused poles to counteract this effect. Moreover, the air gapThe area between the two poles of a dipole magnet, where the magnetic field is concentrated. Also used to refer... is elliptical to guarantee a homogeneousA magnetic field with no or only a very small gradient. NMR teslameters can only be used in fields that... magnetic field. And this, you will no doubt have guessed, is where magnetic field mapping comes in. For each IBA cyclotron, the process consists in measuring the vertical magnetic field in the entire air gap and then tuning it by machining the poles. A critical iterative process: "The final aim of a mappingThe process of measuring magnetic field intensity at many different points, in order to understand the structure of the field... process is to obtain an isochronous magnetic field," explains Yves Paradis. "But also to pay attention to beam resonances that can occur along the acceleration, trying to avoid them whenever possible or, failing that, crossing them as fast as possible." In other words, for a particle to be isochronous it must be in the right place at the right time. The protons must pass through each accelerating gapThe area between the two poles of a dipole magnet, where the magnetic field is concentrated. Also used to refer... when the voltage is at its maximum to receive a kick and hence be accelerated. A Hall probe is used to record the magnetic field value in a polar manner. The probe is mounted on a shuttle moving along the radius: the shuttle slides along a rail fixed to a wheel centred on the pole – quite a feat given that the air gap is just 9 mm across at its narrowest point! "We measure the vertical field componentThe magnetic field is a three-dimensional vector quantity, with three components. Magnetometers may measure 1, 2 or 3 components, or... in the entire air gapThe area between the two poles of a dipole magnet, where the magnetic field is concentrated. Also used to refer..., with a relative precisionPrecision is how closely multiple measurements will be clustered. Also called reproducibility or repeatability. In everyday speech, often confused with... of 2x10-5," stresses Yves Paradis. To achieve this accuracy, the thermal variations of the Hall probe and the steel have to be measured as well. "We then use this map to compute the closed orbits and deduce the cuts to be made." Last but not least, each IBA ESS has a built-in Metrolab NMRNuclear Magnetic Resonance. A resonance phenomenon seen when you irradiate a sample in a magnetic field with an RF field.... teslameterSee magnetometer. : coupled with a Hall probeThe actual sensor that is placed in the magnetic field. The NMR probe contains the NMR sample; the Hall probe..., it constantly monitors the bending magnetIn accelerators, a bending magnet is a dipole magnet used to redirect the particle beam.... responsible for energy selection.